Ryan Flaherty joins teammate Pedro Alvarez on the USA National Team that will compete in the Pan Am games later this summer. Team USA is coached by Vanderbilt skipper Tim Corbin. Cody Crowell inked a deal with the Toronto Blue Jays yesterday according to Matt Rice in today's Harwich Oracle. Cody settled in as Vanderbilt's 3rd starter by year end and helped Vanderbilt pull out their SEC title by beating Ole Miss in the first game on Saturday of the Tournament. Cody was 4-1 with a 4.05 ERA in 2007. He was a red-shirt junior. Moving now to football, Brett Hait's got a piece in today's Nashville City Paper about who the best QB in the SEC is. Adding fuel to the fire are the newly released season "preview" issues put out by Athlon, Lindy's, and The Sporting News. Athlon and TSN has Kentucky's Andre Woodson #1, with Georgia sophomore Matthew Stafford (fresh off his keg training regiment) as #2. Lindy's thinks Vomit Orange's signal caller Erik Anige is #1 with Kentucky's Woodson finishing second. I will be traveling through the southland this weekend (this will be my last Hotline of the week) and will pick up TSN and Lindy's to get a better idea of what they are saying about the SEC year ahead. We'll be previewing the Commies all summer long, so pace yourself. I know we will. It got a little heated yesterday as Running with Sisserson threw out the idea of creating a home-field advantage at Dudley Field by painting the grass gold. Stanimal was horrified, I was not. What do you think? Finally, Thought 16 from Mealmart is another classic and gives some prospective on the cast of characters that frequent the Mealmart experience. Where you heading down this way Bobby? Tomorrow...I'll be in Talahassee for a wedding. So if you see Bobby in the airport tomorrow VSL readers, don't be afraid to come up and tell me how much you like my work. This is the first I've heard of it. Unfortunately Bobby will be missing out on "Midsummer's," a plantation party in Middleburg which will be held this Saturday. Devastating news. Luke List birdied the first hole of the US Open. It's really early, but the leader is only -2 after 18. Speaking of football...what do you guys think should happen to Bobby J if the team has another losing season? 2. With all the talent returning and a favorable home schedule, is this a "show me" year for Bobby Johnson? Will he be on the hot seat if Vandy doesn't make a bowl (or, at the very least, get bowl eligible without earning an invitation)? BO: For me, this is absolutely a "show me year." This is year 6 of Bobby's reign. These are all his players and his system is firmly in place. Top to bottom, this is the most talented Vanderbilt team we've put on the field in some time. Earl Bennett is one of the best players in the country. Chris Nickson has a year under his belt and has steadily improved and developed over the last year and a half. We return the entire O-line and actually have some decent running backs. Jonathan Goff returns and will anchor the defense that played a lot more downs than it should have. If this team, with this schedule, can't find a way to get to a bowl game then I honestly think the question has to be asked as to whether or not Bobby Johnson can take this team any further. Seamus O'Toole: Yes, this is a show-me year. Six wins and he's solidified the job for several years to come. Anything less and the fans will be calling for his head, although the administration might not have the guts to pull the plug seeing as his big contract extension was supposedly a sign of their confidence in him over the long haul. Six is the number to focus on: his 6th season, he needs 6 wins. It's worth mentioning that Bobby Johnson might have the toughest coaching job in college football, not in terms of pressure of course, but in terms of finding ways to win and be successful in what is by far the most brutal conference. There's a good argument to be made that Stanford in 2001 doesn't go 9-2 in the SEC; or Northwestern in '95 to the Rose Bowl with an SEC schedule; or (does this need to be said?) 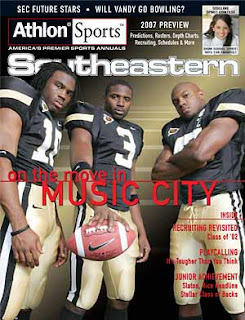 Wake Forest conference champs/BCS bowl out of the SEC; etc. At any given point in this season, 8 teams in the conference could be in the Top 25... So while, in my book, this is a make-or-break year for Bobby, I understand the Herculean task he has and the reluctance of the administration to bounce a guy who keeps churning out successful kids - whether they're on Wall Street or in the NFL or in the lab. Stanimal: I am more on the fence on this one than the guys are. This is a tough call. Bobby J. has done a ton with a program that has been a perennial doormat since the early 1980s. While the recruiting services might say that Vandy's classes have been mediocre at best, he has certainly found a number of players that did not receive a lot of hype that have equaled the prima-donnas in production (Earl Bennett, Jonathan Goff, Chris Nickson,). However, at some point Vandy's football program must turn the corner and get above .500. This year is pivotal in determining whether or not we will gain some consistency in program success, and while I don't think Bobby will get canned for no bowl this year, I'd have to say he will next year (considering most of the skill players will be seniors). Thanks for all the feedback, very insightful. I tend to agree that this is a "show me year" for Bobby. After seeing the improvment and increase in TV/national recognition over the last four years one would have to say that the program is moving in the right direction. However, we still have not had a winning since 1982. On another note our recruiting still needs improvement. We will have 14 freshmen this year and our class ranks 65th overall. Yet, we still fall behind other SEC schools in number of recruits (Ark: 27, Miss State 34, Kentucky 28, Ole Miss 22) However, we have only 1 4-star recruit in DE John Stokes, who will most likely start. In 08 we have 4 commitments all under 2 stars and in the department of OL we continue to sign undersized (under 265 lbs.) linemen. I hope Bobby can turn it around. If not my vote is for G.A Mangus. He has done great work in D3 and has turned every team into a winner he has been on. Vandy is going to a BCS bowl. I feel it. The "rating service" ratings are a bunch of bull crap. Scout has the kid from Lavergne TN listed at 6-6 and 290 who runs a 4.8 as a ONE STAR player. Other places only list him at 6-5 or 6-6 and like 270, but I haven't seen anybody dispute the 4.8 forty. In regards to Michael Bryant (from Lavergne) Rivals has him as a Two star. They are not challenging the 4.8 speed but recruiting profiles say he lacks fundamentals and has bad hands. Speed will diminish when he goes through the strength and conditioning program at Vandy because they will want him to gain some weight. Lets hope Bobby J and company can develop his natural aggressive talent. His hand are so bad that he is the starting center on the basketball team there. LOL!!! How "good" do your hands have to be to play OG or DE?????? Usually if they are good enough to start on a basketball team that has had over 20 wins a year the last 3 years, that would be plenty good enough. The fact that his school runs a 4-wide, no huddle football offense is where the adjustment will be to the traditional college smashmouth game. Maybe they should be looking long term at DT instead of DE or OL. Especially if a guy is going to end up around 6-7 and 300 or 310 eventually. Anonymous is right about ratings services being inaccurate. They are mostly a good gauge for fan bases to follow how their teams recruiting efforts are doing, but rarely ever do coaches rely on them as the primary means of identifying talent (although I'm sure they at least look at these services rankings). The fact is that identification of talent comes from within the coaching staff. From watching video, going out to watch games, etc. So while we love to look at the rankings and the stars, it's important to keep in mind that those rankings are subjective based on the service and vary from service to service (John Stokes is ranked as a four star by Rivals and as a three by Scout. Also, ESPN doesn't even claim him as our top recruit, leaving that spot for Larry Smith and Chris Marve. Like I argued in my earlier post where I profiled each of the recruits, identifying top college prospects is like trying to predict the future and you can only do so by certain indicators, some that can be improved upon and some that cannot. Getting guys like Earl Bennett and Jonathan Goff has been key for our programs improvement because while recruiting services want to label them as mediocre prospects, our scouting efforts identified them as potential game changers. So when you're reading stuff from these services, take it with a grain of salt.